Firstly I would like to thank everyone who visited my blog in past week I have received a lot of wonderful comments on my creations so a big thank you to everyone. I hope you have been over to graphic 45 and seen the wonderful creations since my feature artist post . Now I have just finished my latest project and hope you will enjoy it. 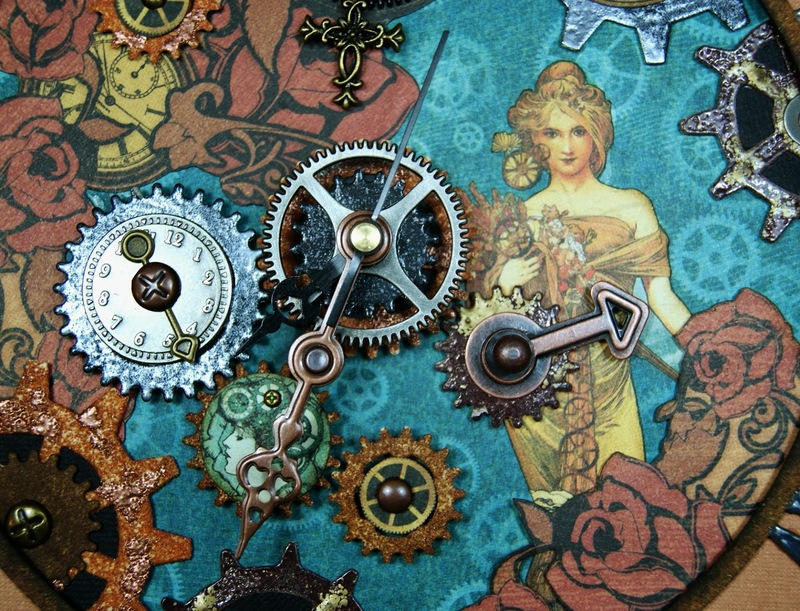 This is my steam punk clock. The papers I used for this project were steampunk debutante and one piece from steampunk spells. All the heat embossing was done with american crafts zing and tim holtz distress embossing powders. All the cogs were die cut from card stock and the embossing gives the rustic metallic finish. There is assorted metal work including large brads from graphic 45.
is also from scrap matts. The chipboard is so ornate and detailed with delicateness. It gives detail to any project. The next photo is a close up of the clock embellishments. Thank you for coming over to see my clock and I trust it will inspire you in some way. join so you can be in the running for the prize. Wow...your talent is truly A-MA-ZING!!!! Lynn G.
This is an amazing piece of art! I love the gears!!! I am going to try making a clock with my G45 papers! Now I just need to decide which collection I want to use as my base! TFS! OMG Andrew I love this clock. You are so creative. I really enjoy your projects. Thank you so much for sharing your artistic talents with us. Hope you and your family have a wonderful Christmas.